Urban chickens are not making as much news as they were a few years ago but plenty of people still keep chickens in their backyard. Chickens, in a lot of cases, have become just another part of the garden. Right now the fall wild bird migration is in full swing. It is not just song birds and waterfowl that fly south for the winter, hawks and other predatory birds are making their way south too. On some days, thousands of hawks will fly over certain areas during the migration. That is causing big problems for some chicken owners, including me. Last week while I was crouched down in the driveway working on my car, something compelled me to turn around. What I saw was a large hawk getting ready to latch onto one of my chickens. 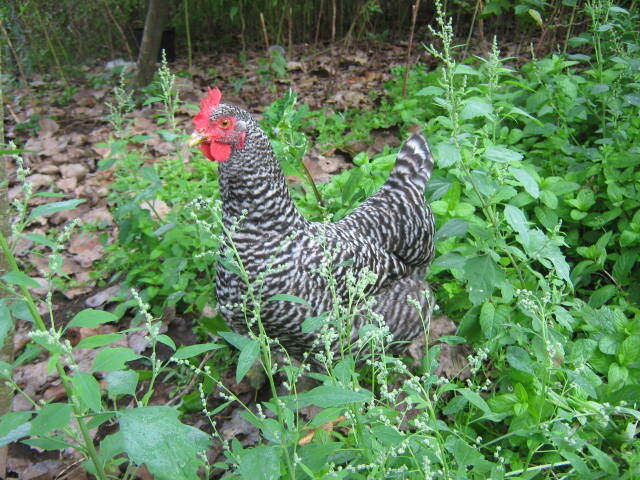 I have about 75 hens in my flock and usually they are quite vigilant in spotting predators. At least one or two hens out of the 75 will spot a hawk and warn the others even if the hawk is quite a distance away. Even the blue jays will screech out a warning call to the rest of the birds in the area when they spot a predator. This time however, a hawk was able to silently swoop down without anyone noticing. I’ve observed that hawks don’t usually bother my hens when there are people close by. The hawk didn’t see me until I stood up and turned around. I surprised it enough that it took off without a chicken and landed in a tree about a hundred yards away. By that time all 75 hens were making quite a ruckus. Hilda narrowly missed a sure death by seconds. That hawk never did come back to try again. I’m sure it looked for another meal as it continued flying south. Don’t think that just because you are in a populated area that your hens are safe from hawks. I live in a rural area but have heard reports of chickens being attacked by hawks in suburban and even urban areas this fall. Free range chickens are the most vulnerable because they often wander far away from cover that could protect them from attack. The best thing to do is keep your hens locked in a pen or chicken run covered with protective netting until the migration is over. Keep in mind that hawks are protected by law. It is illegal to capture or kill them without a special permit. With plenty of rain this season, I ended up a fairly decent crop of onions even without irrigation. Now it’s time to harvest and dry them for storage. Onions have a built in signal to let you know when they’re ready. Once the stalks begin to fall over, they’re done. Even the ones still standing will not make any more growth. I usually knock down the standing plants to help them dry a little faster in the garden. Once the stalks have just started to dry a little bit, I dig the bulbs with the stalks still on and dry them for two or three weeks in a spot where they won’t get rained on. There is usually a little garden soil stuck to the bulbs. I have sandy soil, most of it falls off eventually. So I usually leave the dirt on during drying unless there are large clumps hanging on. These onions are nearly dry enough to be put into storage. Drying is over after the outer skin turns brown and crispy. It’s at that time when I trim off all but an inch or so of the stalk. Most of the roots get trimmed off at the same time. I have in the past left the stalks on and braided the onions. Braided onions make a great homegrown gift from the garden. I separate the onions with extra wide necks and use them first. They don’t store as well as onions with narrow necks. I’ve accumulated a large collection of mesh bags over the years and use them to store onions. The onions need to be kept cool but can’t be frozen. They also need good air circulation. 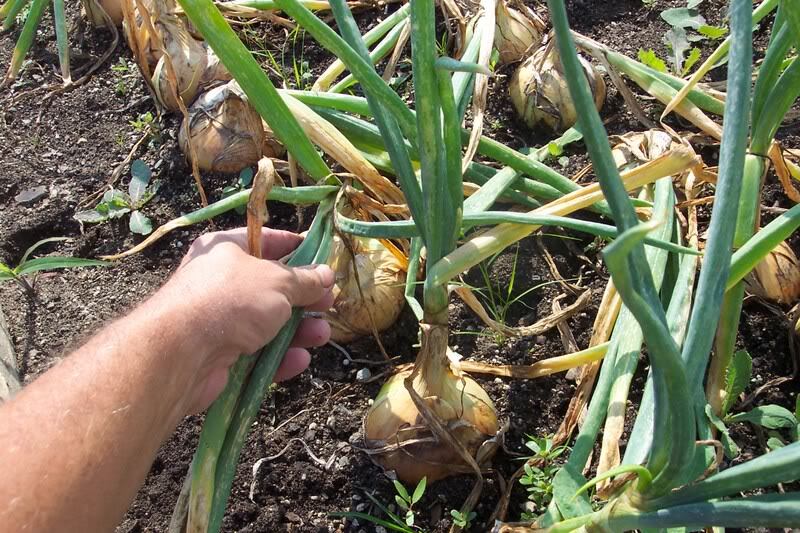 At one time I had a special building that I kept around 45 degrees, it was perfect for onions and other crops. But those days are over and I now I keep them in my garage. The sweet onions don’t keep well so they get eaten right away. The yellow varieties store very well, sometimes lasting almost until spring. During the winter, some onions invariably will start to decay. Those have to be removed to keep the other onions in the bag from going bad. 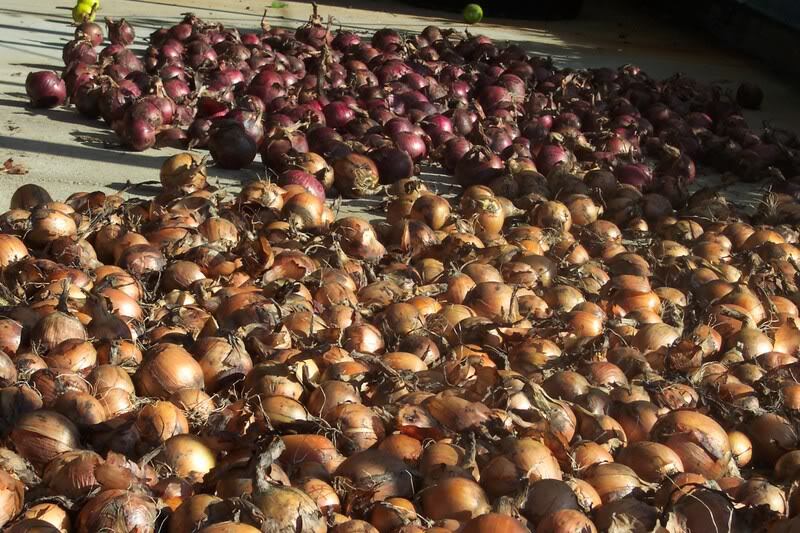 As many years as I have been gardening, I still get a kick out of going to the storage area in the middle of the winter and picking out onions for the kitchen. It’s not your imagination, the growing season is winding down early this year. The excessive rain and cooler than normal temperatures in our area have combined to make it a challenging season for many garden plants especially the warm weather crops like tomatoes or peppers. Farmers are noticing it too. Many field crops never fully recovered from poor start of the season and are showing signs of maturing early. As a result there may be a reduction in yields as well. Certain beds in my garden are already kaput. But there is a silver lining in that. It gives me a chance to plant a green manure crop, which I don’t often get to do. The terms green manure and cover crop are basically synonymous. Green manure is a crop that will be turned over into the soil while still growing, a cover crop may or may not be turned into the soil right away. 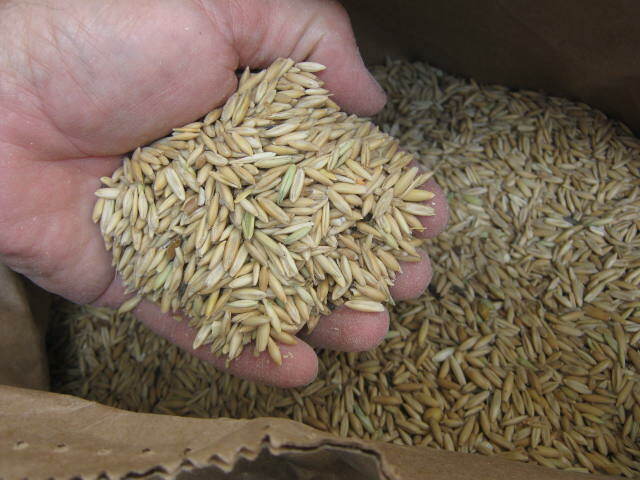 Oats used for feeding livestock are fine for cover crop seed. Note the husks are still on the oats. These types of crops are great for recovering soil nutrients from the soil and holding them until next year’s planting season. Some soil nutrients such as nitrogen are easily washed down into the soil profile by fall rains or melting snow putting them out of reach of most garden plants. Much of that valuable garden nutrients that you worked so hard to build up could be lost. Multiply the nutrients over hundreds of acres and you can see why farmers use cover crops to save money and protect the environment at the same time. Nutrients that stay in the field will not get washed into steams and rivers where they end up being a source of water pollution. In other words, green manures effectively “mop up” nutrients and hold them in place until they are needed next year. In a garden situation, the biomass that a green manure crop adds to the soil may be more valuable than the nutrients they conserve. You really can’t have too much organic material in garden soil. A cover crop also provides a better habitat for soil microbes to flourish as opposed to bare soil. Planting cover crops is a fairly advanced technique for home gardeners even though it is very effective for both vegetable and flower gardens. If this is your first time planting cover crops, consider oats, yes the same plant that is harvested and used for making your breakfast cereal. They make a very effective cover crop. This time of the years we are looking for a plant that will make quick growth and oats fit the bill. Even though they grow quickly, they should be planted very soon. The other big advantage that oats have is that they will die over winter leaving a mulch on the soil surface that can be tilled in next spring. That also eliminates the possibility that they may become a weed in your garden. I’ve had winter wheat come up in the spring — seeds from straw mulch — and before I knew it they became a problem. Have you ever tried to pull up a well established clump of wheat? They’re pretty tough plants. Planting oats is much like planting grass seed except the seed is much larger. Sow oats at a rate of two or three pounds per 1000 square feet about an inch deep. Farmers use an implement called a seed drill to plant oats. The easiest method for a gardener is to broadcast the seed by hand, then till very shallowly with a tiller. Finish off by lightly pressing the area down so the seeds make good contact with the soil. Farm supply stores sell oat seed however you may have to go online to buy small quantities.